Low back pain is a very common complaint. In fact, it’s the #1 reason for doctor visits in the United States! The economic burden of LBP on the working class is astronomical. Most people can’t afford to be off work for one day, much less a week, month, or more! Because of the popularity of hospital-based TV dramas over the past two decades, many people think getting an MRI of their back can help their doctor fix their lower back problem. Is this a good idea? Let’s take a look! Patients will often bring in a CD that has an MRI of their lower back to a doctor of chiropractic and ask the ultimate question, “….can you fix me?” Or, worse, “…I think I need surgery.” Sure, it’s quite amazing how an MRI can “slice” through the spine and show bone, soft tissues, disks, muscles, nerves, the spinal cord, and more! Since the low back bears approximately 2/3 of our body’s weight, you can frequently find MANY ABNORMALITIES in a person over 40-50 years old. In fact, it would be quite odd NOT to see things like disk degeneration, disk bulges, joint arthritis, spur formation, etc.! Hence, the “downside” of having ALL this information is the struggle to determine which finding on the MRI has clinical significance. In other words, where is the LBP coming from? 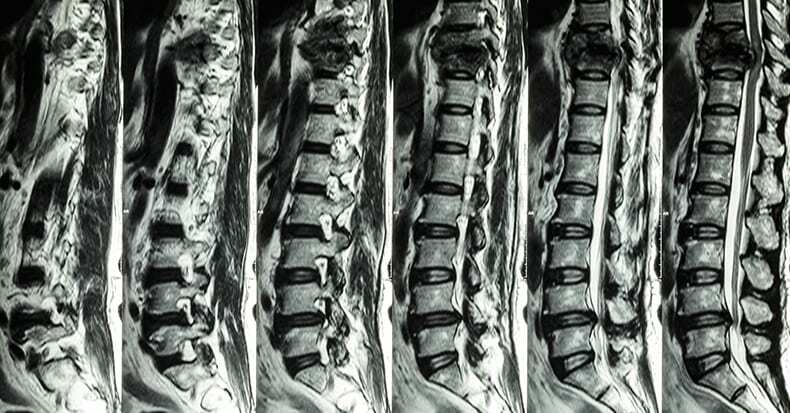 Is it that degenerative disk, bulged disk, herniated disk, or the narrowed canal where the nerve travels? Interestingly, in a recent review of more than 3,200 cases of acute low back pain, those who had an MRI scan performed earlier in their care had a WORSE outcome, more surgery, and higher costs compared with those who didn’t succumb to the temptation of requesting an MRI! This is not to say MRI, CT scans, and x-rays are not important, as they effectively show conditions like subtle fractures and dangerous conditions like cancer. But for LBP, MRI is often misleading. This is because the primary cause of LBP is “functional” NOT “structural,” so it’s EASY to get railroaded into thinking whatever shows up on that MRI has to be the problem. Here is how we know this, when we take 1,000 people WITHOUT low back pain between ages 30 and 60 (male or female) and perform an MRI on their lower back, we will find up to 53% will have PAINLESS disk bulges in one or more lumbar disks. Moreover, we will find up to 30% will have partial disk herniations, and up to 18% will have an extruded disk (one that has herniated ALL the way out). Yet, these people are PAIN FREE and never knew they had disk “derangement” (since they have no LBP). When combining all of these possible disk problems together, several studies report that between 57% and 64% of the general population has some type of disk problem without ANY BACK PAIN! Hence, when a patient with a simple sprain/strain and localized LBP presents with an MRI showing a disk problem, it usually ONLY CONFUSES the patient (and frequently the doctor), as that disk problem is usually not the problem causing the pain! So DON’T have an MRI UNLESS a surgical treatment decision depends on its findings. That is weakness, numbness, and non-resolving LBP in spite of 4-6 weeks of non-surgical care or unless there is weakness in bowel or bladder control. Remember, the majority of back pain sufferers DO NOT need surgery!